Ideally, when you are belaying the leader, the rope is never taut, which would impede the climber's next move. An alert belayer keeps just a hint of slack and responds immediately to the leader's advance by paying out more rope. When the climbing is easy, more slack is permissible. As the leader climbs, it is inevitable that some friction will develop along the rope. This rope drag can greatly increase the difficulty of the climb or make the leader stop, creating time-consuming extra belays, often in uncomfortable spots. The problem can be caused by the terrain the climber passed, such as blocks of rock or rope-sized notches, or by poorly placed protection that forces the rope over convexities or into acute angles. Any friction applied by the belayer is multiplied by these, so if the leader tells you that rope drag is a problem, keep a few feet of slack in the rope and do everything possible to eliminate any pull. If the climber falls when there is a lot of friction in the system, the belayer may actually be unsure whether a fall took place. 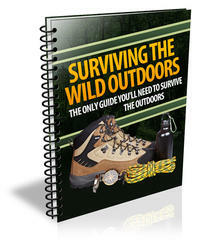 If it is impossible to communicate with the climber, you can find out by letting out a few inches of rope. If the same tension remains, then you are probably holding the climber's weight. Ideally, when you are belaying a follower, there is no slack in the rope. At the same time, the rope should not be taut, which would hamper the climber's movement and balance. When belaying a follower up to you, pile the rope where it won't be disturbed later. Don't let loops hang down if there are projections that could snag a loop. If the entire pile must be moved, picking it up is tempting but will produce snarls later. It is best to re-pile the entire rope twice, so the leader's end is on top. If the follower is climbing rapidly, you can take in more rope with each pull by leaning forward or bending over. Your braking hand must never leave the rope. This is easier when belaying the leader because the leader is pulling up the slack. But when belaying a follower, you pull the slack in against gravity, and when you reset your braking hand, the natural tendency is to lift it off the rope. The correct procedure must be consciously learned (fig. 7-10). Fig. 7-10. 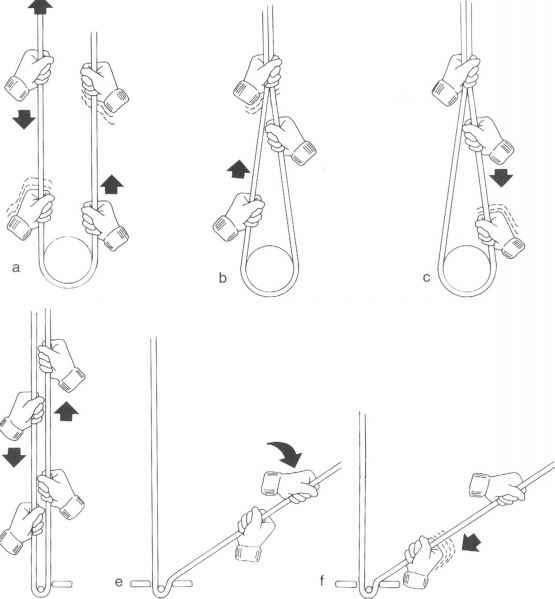 How to take slack in from a follower so the braking hand is always on the rope: a, pull in the rope with both hands; b, extend whichever hand is near your body, and grab both ropes with it, so that; c, the braking hand can slide back toward your body while remaining closed and ready to brake. Although a through c is commonly used with belay devices, another method offers extra security, as when the climber is at a crux. Keep the ropes in steps b and c apart and grab only the braking rope, as shown in the lower row of illustrations (d, e, and f). protection, then letting it out again as the climber moves past the protection and puts renewed pull on the rope. These switches call for extra attention, especially as this tends to happen at the most difficult spots. As climber and belayer get farther apart and hearing begins to be difficult, stick exclusively to the set of short commands that have been developed to express essential climbing communications. Prefacing them with explanations or justifications makes them harder to recognize and defeats their purpose. Use the commands alone. They have been chosen so that the sounds and number of syllables produce a distinctive pattern. Toward the end of the rope, shout as loudly as possible and space out each syllable, using very big spaces if there are echoes. In a crowded area, preface commands with your partner's name. Don't expect an audible response; just do your best the first time. Three problems are common at the end of each pitch, when hearing is most difficult. First, when calling out to your leader the length of rope remaining in the coils, the first syllable is often lost, and if normal word order is used, the leader hears only "—ty feet." Instead, invert the word order and pronounce each digit separately: "Feet: . . . three . . . zero," for 30 feet. The climber will pause upon the first word and have a better chance of understanding the remainder. Second, when the leader completes a pitch and calls "Off belay," do not respond with "Belay off" to indicate you heard him, as is the natural reaction of a beginner. "Belay off" means you have taken apart your belay and the rope coils are ready to be pulled up, and you won't be ready to shout that command truthfully for a while yet. Third, avoid the impatient question "On belay?" unless a truly inordinate amount of time has passed. Usually the leader, at work on setting up anchors, is out of earshot anyway. Commands are sometimes transmitted by rope pulls, but there is no universal system. Because of rope stretch at the end of long leads, it's necessary to greatly exaggerate the pulls. A simple tug will seldom be felt at the other end. Take in all slack and for each signal, yank 1 foot or more, holding it tight for awhile before releasing the tension. If there is much friction, pulls may not be distinguishable from normal rope movements. The most common commands correspond to the number of syllables in these verbal equivalents: one pull means "Slack," two means "Up rope," and three means "Belay on." In reality the follower often decides when the belay is ready, based upon a partner's known rope-handling habits. Regular partners familiar with each other's habits can dispense with all normal commands, which is more aesthetic.